I am almost done with the 10 Ways to Make Pirate101 More Challenging series! After this post, there will only be two more! Woohoo!!!!! I mean, I have enjoyed making these posts and all, but it always feels good to finish a project. Anyway, I have talked in other posts about how important gold is in Pirate101. You need it for gear, weapons, ships, ship equipment, companions training points.......The list goes on and on. 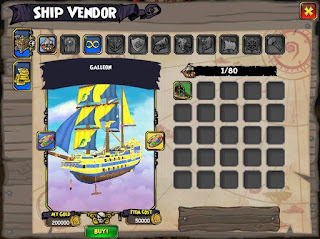 So that brings us to the 8th challenge; complete the whole main quest line in Pirate101 without spending any gold. Read on for more details. 1. Do not spend any gold on gear, weapons, ship equipment, etc. 2. You may equip a pet if you receive one while questing or farming on this pirate. It may only be trained with items you also receive as drops. 3. You may only level your companions with points you receive through main and side quests, as well as free tomes found throughout the spiral. 4. You may equip new gear and ship equipment, as long as it was received as a drop on this pirate, through either questing or farming. 5. You may take advantage of using companion orders. 6. No crowns shop gear, packs, companions, pets, henchmen, ships, ship equipment, etc. 7. No morphing new pets. 8. No transferring items from any other characters you have via the shared bank. So basically with this challenge you should not be spending either gold or crowns on anything that would directly affect your questing. 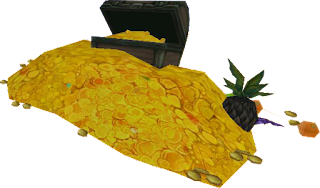 Everything you use to better your pirate, pets, or companions should be received for free (not including being gifted). 1. Farm, farm, farm! Especially for weapons, pets and ship equipment. An awesome pet can really help a lot! 2. I already mentioned this above, but once you get a few companions, taking advantage of giving them orders to help you get stuff will really help out a lot. 3. Completing side quests will help you get even more free stuff, as well as open up new areas to farm. 1. You may purchase one new ship of your choice from a vendor (not crown shop) in the following worlds: Cool Ranch and Marleybone OR Aquila (not both). However, any ship equipment you use must be from drops. 2. You may purchase any houses or furniture you want, since these items do not affect questing. 3. You may purchase or rent a mount, since this also will not directly affect questing. 4. If you really want to stitch to get a certain look, that's up to you. However, your gear stats should be from gear you received as a drop. 1. Make this harder by eliminating the use of companion orders. 2. Make this challenge slightly easier by choosing one thing to spend gold on: Ship equipment OR one set of new gear per world OR companion training points OR pet stuff (training, morphing, etc). So that's it. 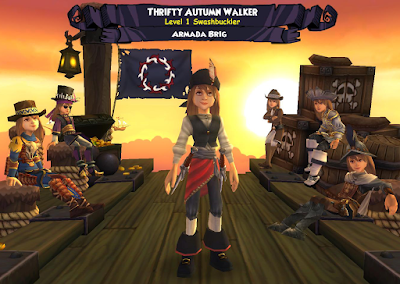 I have decided that this is the challenge I am going to try out soon with a new character, Thrifty Autumn Walker. I should have my first post about her within the next couple weeks, so be sure to watch for that! I am also hoping to finish up this series next week. Meanwhile, comment below and let me know if you have tried any of these challenges yet! Thanks for reading and see you soon!